▲ Palestine has been registered as a member state of UNESCO and the United States has lost their position in the organization. UNESCO, United Nations Educational Scientific and Cultural Organization, is well known for its activities in designating certain places as cultural heritage sites all over the world. As one of the organizations that has been founded by the American government, the United States utilized the organization to protect the culture of countries and promote peace. However, ever since Palestine was given a place in UNESCO, the United States has stopped all traffic of financial support that was given to the organization. This led UNESCO to deprive the United States from their voting rights in the organization. Since the U.S. government has been taking a huge part in providing financially, this has become an international issue. Ever since UNESCO was founded in 1945, it has been working as a part of the UN to promote peace. The goals of UNESCO are to provide freedom and rights for race, gender, language and religion in society through cultural movements. UNESCO focuses on cooperating internationally to promote education, science, culture and other intellectual fields in all parts of the world. In addition, UNESCO uses the media as their source to spread knowledge and understanding in countries and designates cultural heritage sites and monuments to maintain historical culture. As the country that has given so much support in founding this organization, why has the United States stopped providing financial support to UNESCO? 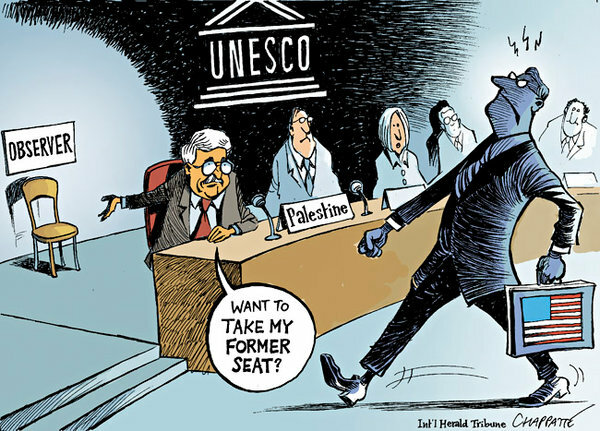 To begin with, the Israel and Palestine conflict is one of the reasons the U.S. is against Palestine from being recognized as a member of UNESCO. According to the book “Fateful Triangle” written by Noam Chomsky, a famous American linguist, the Israelis and Jews lost their land after the fall of Jerusalem in the year A.D. 70. Also with the holocaust during the World War II, they were forced to live as wanderers. During the First World War, the Great Britain declared the Belfour Declaration, a document that granted Jews the right to build their own nation in Palestine, the land of their ancestors, to gain Jewish support residing in United States and Russia. This led to a gathering of around two million and three thousand Jews to create a movement from 1900 to 1933 to enact the building of the Jewish land called Zionism. This in turn led to a conflict with Palestine and in 1947 the UN allowed Israel to be a member of UN with the help of Great Britain. The conflict continued throughout ages and is still a big issue around the world today as Israel continues to abuse Palestinians living in the Gaza region. Moreover, the influence of the Jewish people in the U.S. is also one of the reasons why the U.S. denied Palestine as a member of UNESCO. Although Jewish people only consist of two percent of the U.S., they actively take part in the areas of economy and politics, and have a lot of social influence in the United States. Jews earn 15 percent of the total GDP and are in large control of the social media. For instance, Arthur Ochs Sulzberger, the publisher of the New York Times, one of the major news agencies in the United States is Jewish. The Wall Street Journal, and the Washington Post are run by Jews as well. According to Forbes, 12 out of 30 world renowned corporations were either founded or is currently run by Jews. In addition, when viewed from a political point, 32 of 100 senators are Jewish. This reflects how massive the power of the Jews is in America and gives details as to why America denied agreeing to the involvement of Palestine as a member of UNESCO. This brings another question to mind: What are the negative effects of losing fund for UNESCO? Due to the loss of 22 percent of their annual funding, UNESCO is now limited in the activities that they can perform around the world. Currently, UNESCO is unable to make progress upon their ideas of rebuilding water facilities in Afghanistan, and teaching students in Africa. In addition, around 336 projects have been halted. This has led UNESCO to stop the world’s future generation from learning about peace and past mistakes made throughout history. Also, cultural preservation projects will be deterred as UNESCO would be unable to follow their primary purpose of spreading knowledge to the world. Employment within UNESCO will now also be limited. According to the New York Times, UNESCO headquarters is located in Paris. There they had increased around 900 job positions to help the low employment rate in the country. However, after the United States cut back their funding, the headquarters is on the brink of letting some people go to bring their finances in order. One thing to remember is that the cut-backs of financial funding from America to UNESCO led itself to relieve the voting rights of the United States. This is critical in many ways for the United States; first politically, the United States has the possibility of losing their reliance internationally. According to Irina Bokova, the current UNESCO director general, America’s international influence will wane. This is due to the fact that UNESCO was first co-founded by the United States and the loss of the co-founder’s voting right is the first-time event in an international organization. In addition, she claims that the loss could mean that the principles of what America wished for when building the organization might change as time passes. The former Assistant Secretary of State for International Organization Affairs, Ester Brimmer also noted that by losing their stance at an international organization, the “soft-power” which America frequently used as their diplomatic method, will have less effect in the near future. Apart from this, in the cultural aspect, one critical point is that, the U.S. will not be able to intervene with the choices that the members of UNESCO will make. Currently, the United States has registered two places, Poverty Point in Louisiana, and the Spanish Mission in San Antonio, to be recognized as cultural heritage sites. Nevertheless, according to the New York Times, they both are in jeopardy of not being officially registered in UNESCO. Overall, it is impossible to say that America does not understand the severity of what losing a vote in UNESCO could mean. There are strong chances for a country that has funded around 22 percent of the total finance of UNESCO to have received much of its efforts paid back to them. However, with the loss of voting rights, this is tragic to the U.S. and to its country’s image around the world. As a co-founder of UNESCO, it is time for them to follow the ideal message that they wanted when they created the organization, to bring peace to the world.